Basketball players have been turning out for the Gamecocks tournament for the last 22 years. Surveying the gymnasium at Royal St. George College (120 Howland Ave.) was like walking into an ageless basketball wonderland: teenagers squared off against middle-aged men, a 70-year-old warmed up for his game on the sidelines, and a referee called the shots in a chicken suit. At the 22nd annual Gamecocks charity basketball tournament held in the school, player registrations and raffles helped raise money for the Canadian Cancer Society and the Thomas J. Webb Memorial Scholarship Trust. The players played for a cause while having as much fun as possible along the way. “It’s hard to get too worked up when you turn around to argue with the referee, and you’re arguing with a chicken,” said Sean Loucks, founder of the tournament. 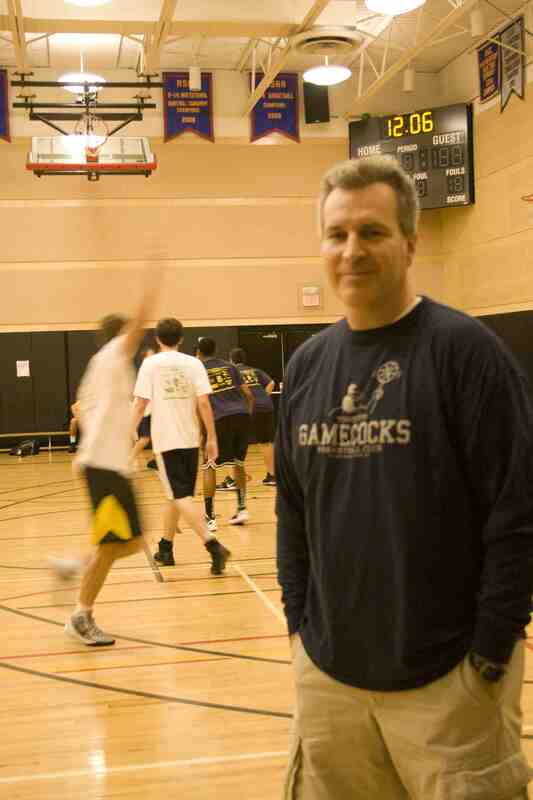 Loucks, a basketball coach at Royal St. George’s and co-founder of the Albany Avenue Basketball Association, was a former player at York University who played professionally in Europe. Loucks has a true passion for the game and claims to have played, “more than 200 games a year across five leagues” when he was younger. Loucks is 47, but says his body feels much older. Though he regrets the toll basketball has had on his body, he plays out his enthusiasm for the game through the Gamecocks charity tournament. The 3-on-3 tournament entered its 22nd year on June 16. The tournament “is very inclusive,” Loucks said, and emphasizes the social aspects and charitable causes over winning and losing. Lance Winn, Loucks former teammate at York who has been involved with this tournament since it started. “It’s more about [being] social, about the exercise and reconnecting with people you have known for a long time,” he said. Although it was only men who took to the court this year, Loucks said the tournament previously had a women’s division; however “it was hard to find a sustained interest by female players.” He said the tournament is open to women, and he’d reinstate the women’s division if interest returned. The tournament is also a way to help give back to the community. Loucks has a personal connection to the Thomas J. Webb Memorial Scholarship. Thomas Webb was a friend of Loucks, who relocated from Chicago to Toronto. Originally from Wisconsin, the two connected over their mutual love of basketball. Loucks said Webb loved 3-on-3 basketball and had actually made it to the championship of a 3-on-3 tournament in Wisconsin that took place during the halftime of a Milwaukee Bucks NBA basketball game. However, Webb lost a battle to cancer at the age of 35 in the late-1990s. When Loucks heard that Webb’s parents had set up a scholarship fund in memory of their son, Loucks added that to the causes benefiting from the event. “We did it first for the Canadian Cancer Society, but then (Tom’s) parents told us about his scholarship and that was a lot closer to us,” Loucks said. James Webb, Thomas’ father who still resides in Wisconsin, said they came to the game as recently as last year. The Webbs have family in Toronto and James Webb said they try their best to visit during tournament time. James Webb said the memorial scholarship for his son helps benefits three to four students graduating from the Sturgeon Bay Wisconsin high school. To be eligible, the students must be entering college to play varsity sport, have good grades and also show a commitment to helping their community. Winn said the tournament is great for basketball in Toronto and they are always looking to help it grow, especially with the younger players in the area. “The legends division always kind of stays the same, but it’s the teenagers we’re looking to build on,” he said. Sean has done so many wonderful things for his community, his sport and the kids involved. We really need more men like Sean in this city. Keep up the good work! Sean is an all round good person; kind and thoughtful. At this present time, he is in Europe with his basketball team and I know, they will perform well! Sean is the most unselfish man I know. He looks out for his players, his community, his family and anyone else in need. His sense of fair play, his sense of humour and his truly open mind and open heart have always had my respect and admiration. He is also one heck of a great “little” brother!